The first open-core user conference, KAZOOcon was introduced in 2011 and was a momentous introduction to 2600Hz’s platform, KAZOO. The conference was led by 2600Hz Co-Founders Darren Schreiber and Patrick Sullivan with the intent to focus on the technical journey of KAZOO and how the geo-redundant platform would change telecom infrastructure as we knew it. Ultimately it provided an open core solution that could be shaped by the imagination of developers and could be tailored to a multitude of users (developers, resellers, SMB’s, etc). The first few KAZOOcons consisted of developers, engineers and technical minded individuals coming together to share best practices on how to expand this unique open core technology. As the platform evolved and functionality of KAZOO was optimized, the user base expanded and offered technology that could be utilized by a multitude of businesses across the telecommunications market. From 2011-2016, KAZOOcon continued to mature and offered both technical and business opportunities for attendees to exchange valuable business insights, network with like-minded professionals, and redefine their business through advancements and thought leadership. Attendees could not only dive into the technical intricacies of KAZOO and open source developments, but also learn about new apps and features being released that could optimize their platform and increase revenue share. A truly complete experience. As we fly into 2018 where communications channels emerge constantly and mergers and acquisitions cause companies to question the future of their infrastructures, staying ahead of industry trends and changes are imperative. We continue to enhance the KAZOO offerings based on customers feedback, industry shifts, and changes in technology. Therefore, our focus for the KAZOOcon 2018 program is to explore the hottest trends across unified communications, identify more dynamic business opportunities and deep dive into new and upcoming product enhancements that will redefine the communications world. You can dive into our exciting agenda, here. 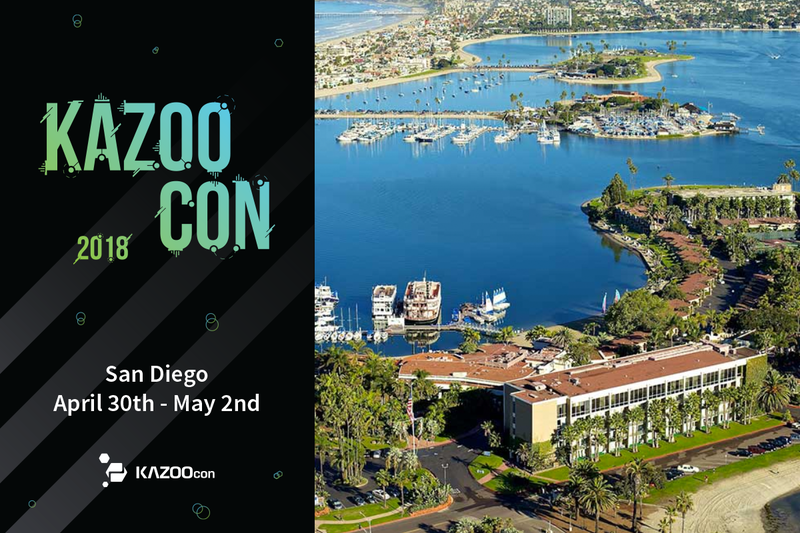 We’ll kick off the conference on April 30th at the Bahia Resort, with the first annual KAZOO Hackathon. We’re targeting both business minded and tech savvy attendees to get creative and will have our CTO and lead engineers onsite to help guide and support in this event. Why not have a little fun before all the session excitement gets started, right? KAZOOcon 2018 sessions will officially kick off on Tuesday, May 1st. The scheduled keynotes will cover everything from the KAZOO Roadmap to high profile industry leaders sharing best practices on their successes across the communications world. Following these insightful sessions, we’ll dive into breakout sessions that cover technical topics such as: ”Developing a Bulletproof Platform: Understanding Provisioning & Failover Opportunities” and “A New Way to Build Innovative CPaaS Apps” or venture into business fundamentals and learn more about optimizing business operations at sessions like “ Securing a Powerful Brand in Communications” and “The Ultimate Guide to Transitioning a VAR into a Complete Cloud Service Provider” covering essential tools on how to optimize business technologies, development and operational strategies. Don’t worry, it’s not all about 2600Hz and KAZOO. You’ll hear from companies such as: Slack, Serenova, Ooma and other major industry players, as they talk through the various opportunities, challenges and technologies used throughout their transformational communications journey. And we can’t forget about our amazing event sponsors, given they are such a significant piece of the KAZOOcon experience. This year, we’re excited to partner with our Platinum Sponsors: Yealink & R Squared. Other valued partners sponsoring KAZOOcon this year include: Vinix, Innovista, VoIP Innovations, SIP Oasis, Kamailio, Ooma, Audian and 888VoIP. We’re down to 40 tickets remaining -- so be sure to get yours before they’re gone. Visit http://kazoocon.com/ to view the full agenda and register today. We hope to see you there as this is the communications conference you won’t want to miss!